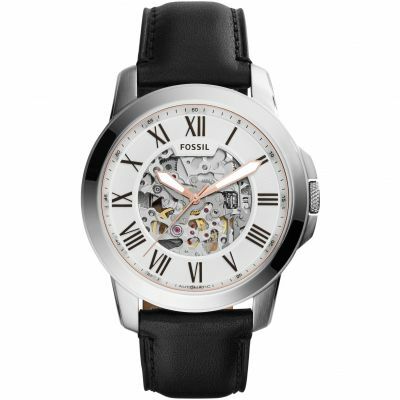 Fossil Grant FS4835 is a functional and very impressive Gents watch. Case material is PVD rose plating and the Dark Blue dial gives the watch that unique look. The features of the watch include (among others) a chronograph. 50 metres water resistancy will protect the watch and allows it to be submerged in water for periods, so can be used for swimming and fishing. It is not reccomended for high impact water sports. We ship it with an original box and a guarantee from the manufacturer. Brilliant stylish watch made up with it. What a great watch. Looks so classy and its under 100 pounds. Looks very expensive. Looks great & works to perfection, very pleased with it! Fast delivery and a percentage was offered on my first purchase. Great site as I love a nice watch. excellent watch. just as I expected. 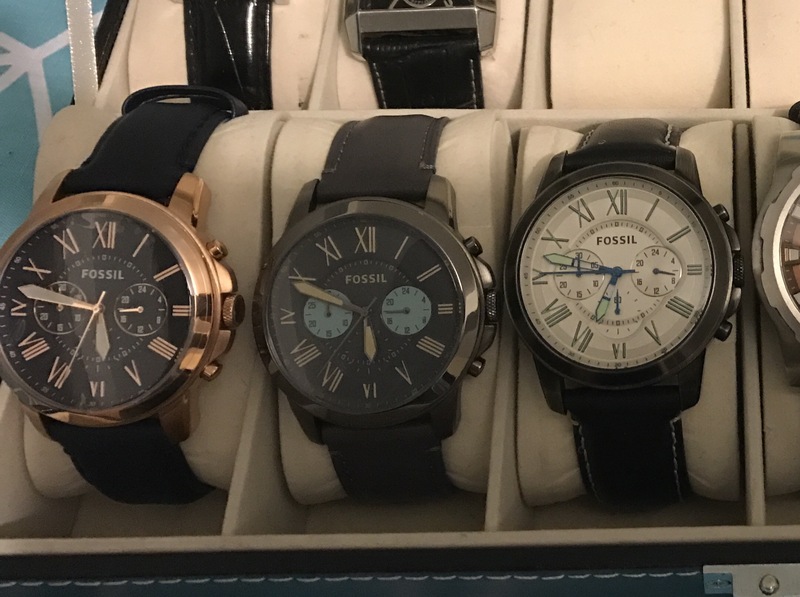 Always buy Fossil these days for mid-range price bracket watches. This is the fourth in my collection. Very reliable manufacturer. Excellent quality and VFM. Styling looks like it should cost two to three times as much. Bought this one specifically for work as we all wear navy blue uniforms and the face and strap were an ideal match. The rose gold numerals and casing give it the extra bling factor that turns more than a few heads. Good buy, good value for money and delivered on time, well presented and wrapped up. Very nice looking watch with the blue strap that looks even better in real life than the picture and really compliments the watch face. A beautiful looking watch that has made a lovely present! Been looking for a smart looking watch for a while now, saw this one and had to have it. Always get compliments whenever I have it on. The watch is gorgeous, really classy! Was very pleased with the product however, non of the smaller dials work!! Unfortunately I am unable to send it back as I got it around Christmas and its just been given to its recipient as a birthday gift. Very disappointed. Very nice watch. Looks smart and boyfriend loves it. Beautiful watch my son loved it. Very pleased with my watch! Exactly what I wanted. Looks very good with the rose and blue. Can be used as a dress or casual watch. Watch was a Christmas present for my son.\r\nHe loves it. Beautiful watch, my husband was delighted . 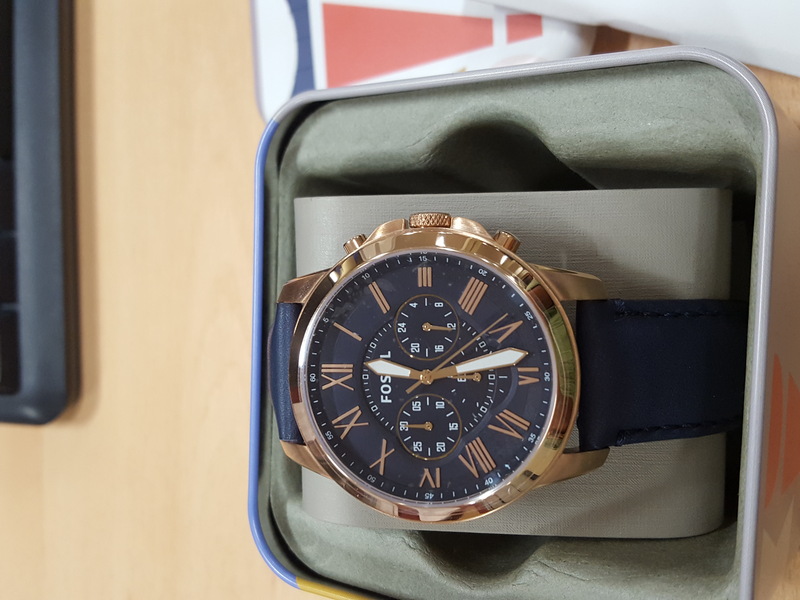 Another excellent purchase from the watch shop, I collect fossil watches so this design and colour was perfect for my collection, and as always the delivery was on time. Lovely watch. Bought as a gift for my husband for Christmas and I know hell love it! This watch was for my husband and its just perfect for him. Beautiful watch really worth the money. Great watch, looks lovely on! The gold really compliments the leather blue strap and looks worth a lot more money than paid! Bought this Great looking watch at a very good price as a gift. Would buy the female version for myself. Would recommend for all ages. 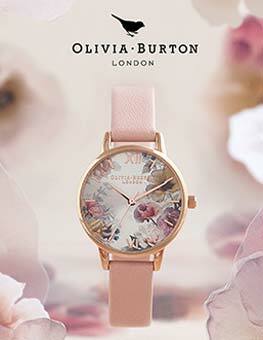 Stunning,Beautiful, Stylish Watch . My son has wanted this watch for ages now and has dropped various hints as a want for Christmas. Very on trend watch chronograph in rose gold and navy ,very classic . My husband is very hard to buy for and when he asked for a watch for Christmas I thought I would never find one that ticked all the boxes. He didnt want it too chunky but he needed one that he could see without putting his glasses on. Black was too plain but colour too bright so the blue is tastefully different and will match with anything he wears.. Its not too blingy but is noticeable. It will not just tell him the time but will be an essential part of any outfit. Having had a fossil watch myself I am certain it will be accurate and reliable and would recommend it highly. For day or night wear, this is the perfect watch! Amazing product - this is my 3rd watch of this style , just a different colour. A great fit and a good addition to my collection. This is a beautiful and quality watch. Worth the purchase. Great service and quick delivery, highly recommend! Really like the look of this watch! My boyfriend somehow lost his fossil watch. So, I have got him this for Christmas. Bought for my Boyfriend - he loves it so Im thrilled! Comes in a cute metal box, perfect size. I bought this as a 18th birthday present for my grandson. He loved it and it fitted well. All in all, it was exactly what I hoped for. Excellent product. Amazing dial with lovely strap. Great look. Love the product. Lovely watch, darker blue than in the picture. This was a present so had it engraved on back as plenty of room. Lots of comments when it was worn . Bought as a gift and my husband loves it. Looks fantastic especially with denim. Great fit and so easy to see the time. The watch is fantastic really like the style and service provided by watchshop. The watch has got a fault but the watch shop have been happy enough to resolve the problem with me. Bought for my grandson who absolutely loves it. Perfect size and colour. Excellent delivery service. I bought this watch for my partner to wear it on our wedding. This watch is presenting absolutely amazing, great colour , high quality. Looks even nicer on the wrist that on the picture. Smart and stylish. Great watch for the value, looks more expensive than it is. Impressive service and delivery. The Watch did not look the same as on the picture. Ofcourse the product was the same. This was not my first order with Watch shop. Always dependable when it comes to delivery. I bought this watch for my son, he said it is the best watch he has had so far and is very comfortable to wear. He loves it ! It is a very beautiful and mo134dern watch\\\\r\\\\nI like the quality of the leather used\\\\r\\\\nI wish you can make it a little bit bigger as i am a person who likes big watches\\\\r\\\\nA rose gold plated metal and a blue leather hands. 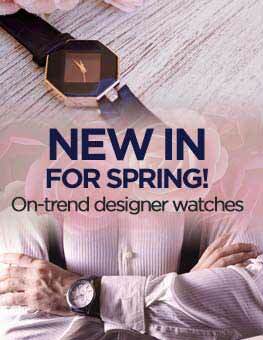 It is a very stylish and modern watch which stands out anytime you wear it. Like other reviewers have said the stock photo simply doesnt do it justice. The strap is a much nicer darker navy and its not shiny but a nice matte finish. The face is everything, whilst a roman numeral is incorrect who honestly would notice it. Top watch, for an unbeatable price. Absolutely love this watch! Great design and great look. Very well built as well! First time user of Watchshop, the product service and communication was first class. I will definitely recommend to friends and the comments about my watch have been nothing but complimentary. This is a very high quality watch. I usually dont go for this colour, and Ill stick to black or brown leather strap however this was a gift to me, and when I opened it I was very pleasantly surprised and the watch is amazing. Its made with good quality metal and you can feel that in the weight, its a bit heavier than a cheaper leather watch, so that is great. All the dials work well and its overall a great watch. For the price listed too, at a discount its a watch of a way higher price bracket, but even at its full RRP of £125 its a bargain. First class service. Product as described, excellent value for money. Excellent watch, looks more expensive than it was, strap very comfortable and looks good. Not too thick or the face too large. Great buy - a very happy grandson. Lovely watch. Nice big face, great for my partners big wrist. The strap is also noce and big which fits great. Nice soft leather. Great watch that will go with everything. Would recommend this watch to all ages. This is a nicely proportioned watch. I was conscious of not buying something too large as it causes issues when worn with shirts for work. This is as big as I would like, it looks the part and seems solid and well manufactured. Looks a little better than the pictures and the rose gold is not too rose for a guy to wear, which was my only concern when ordering. Was very happy with the look and design of the watch. My nephew loved it. The delivery of this item was so quick. The quality is really good at such a low price. I would definitely buy from watch shop again. I bought this product as a birthday treat for myself after hunting for a long time for just the right watch and I am not disappointed! 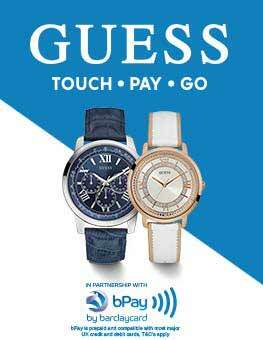 The colours of the watch are more subtle than the image on display in the advert. The piece itself has a classic look to it, something I was looking for and the glow in the dark panels on the hands make it really easy to read at all times. The strap feels solid and like it will last for a while. I found it did take a couple of days to form the correct shape around my wrist but thats probably due to the strap being made of leather and after this it is very comfortable to wear. Needs to be worn slightly further up the wrist that I usually wear my watches, so that if you lean on your hand, the dials dont dig into the back of your hand, or alternatively you could wear it on the other wrist, depending on your preference! The display is big enough to be easily read, including the minutes. Delivery of the item was fast, ordered it on the Tuesday and arrived via Royal Mail on the Wednesday with real time tracking messages sent to my phone to let me know the watch had arrived. Even better, this next day service was provided for free! It does have quite a large face and would potentially look a little too big on those with slimmer wrists, however it looks perfect on mine. The two year guarantee is also great. I picked mine up for £95 but have just seen its gone up to £100, £5 bargain, even better! Overall I would definitely recommend the watch and the website to other users. 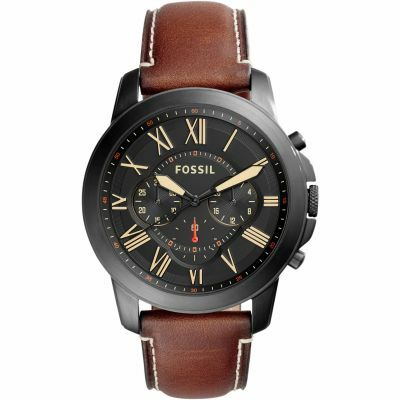 Bought this watch for my sons graduation from university - he is soon to be 21 and it is a brilliant watchlooks really nice. 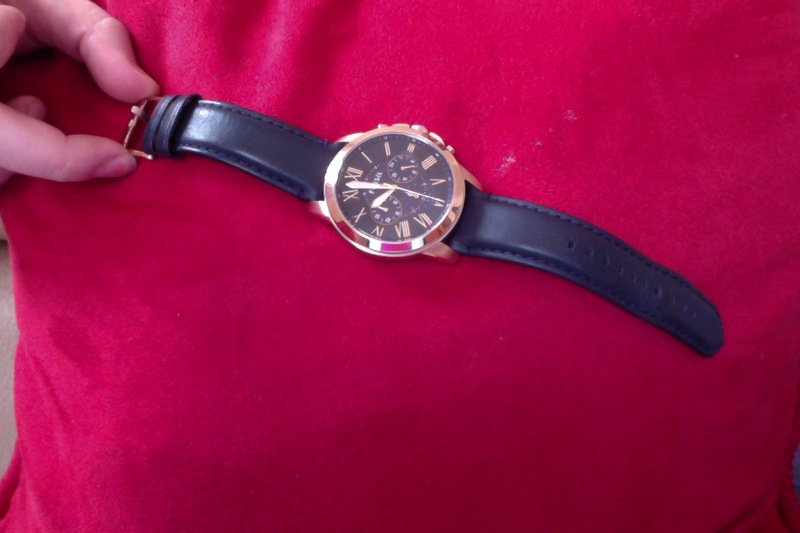 I ordered this watch as a present for my boyfriend, so unfortunately I cant upload a picture as its wrapped up! Im really impressed with the quality of the watch, I have a fossil watch and I love the brand, but this watch has surpassed my expectations. The watch looks nice online but the real thing is so much nicer, the the rose gold finish is such a nice shade, I was worried it wouldnt look manly enough but its perfect and it really compliments the navy of the face and the strap. The face is quite large but it doesnt at all feel clumpy or over-sized when held. The face is also really nicely done, the colours and numbering are really nice and clear. I wanted a watch that was special, smart and stylish but not too special or too formal looking because I dont want my boyfriend to be scared of wearing it! I think I made the right choice here, its sophisticated but everyday too, perfect! I found this watch in a store one day and just thought my boyfriend would love it, It was a spontaneous buy which I never normally do so I decided to see if I could find a better price online. I ended up finding it on watchshop for a much more reasonable price and thought what the heck. I never buy watches online as I had bad experiences in the past with knockoffs but side by side these watches are identical. The watch itself is stunning, beautifully crafted. 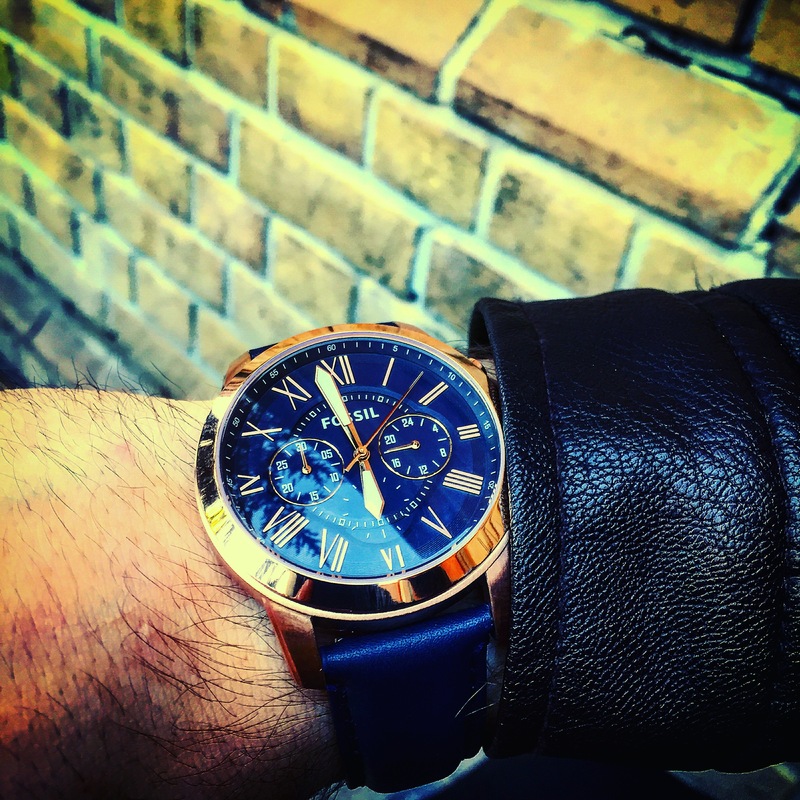 The leather strap is a vibrant blue against the rose gold of the watch case. The face is plastic on the inside but you can only tell from looking at it really up close and for the price you really can’t complain. It gives an air of sophistication without the high budget. I love this watch and was super happy my boyfriend did too! Its been long since I got myself a nice watch, and I am defiantly happy with the choice Ive made ! 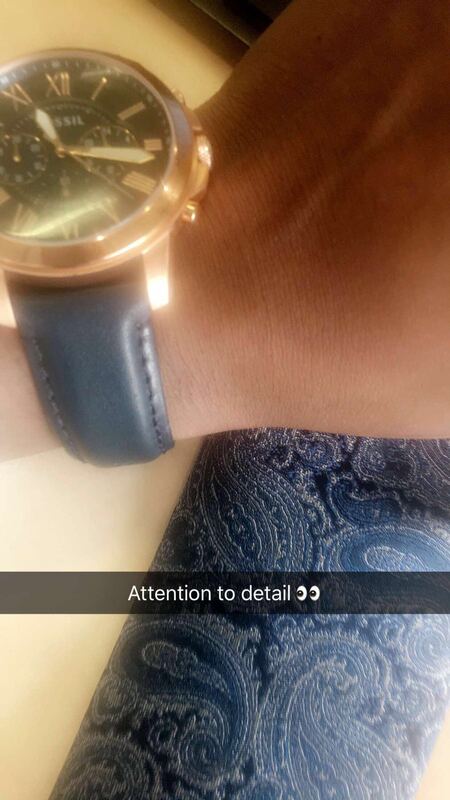 the blue and gold on this watch looks so classy and elegant , its not too dark or to bright just the perfect tune . Im in love with how it looks and how it feels ! I purchased this watch for my husbands birthday. It is an absolutely stunning watch, value for money, excellent fit and next day free delivery. He was very impressed and loves the look of it. 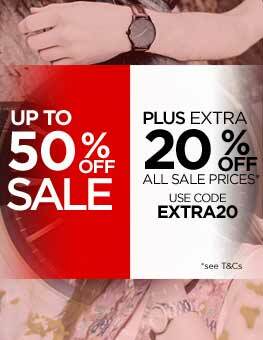 Watchshop are excellent, prices cannot be beaten and would definitely recommend to everyone. This product is so amazing. I bought it for my self, but i guess my brother loved it more and he took it from me. I guess soon il order another one. its really classy. I would like to suggest other people to get one. The delivery was on time and the package was excellent. Very happy with this product, was here 2 days after I ordered it so cant complain about anything. Lovely, deep blue colour which is enhanced by the rose gold metal. Although its a mans watch I bought it for me. Great size, easy to read and very comfortable to wear. Only thing missing is a date function. Great package, just in time. It is an amazing watch. Excellent product and delivered on the day it was estimated to be delivered. Well packaged. The only disappointment for me was that i missed out on the bigger discount earlier in the week. Bought as a gift for my boyfriend, he absolutly loves it! Lovely looking watch and excellent value for money. I took a bit of a risk on this one as my boyfriend has always liked black and silver when looking for watches but really liked this one myself when browsing. It actually looked slightly different from the site images but to be honest I liked it even more, and more importantly, so did my boyfriend! The colour itself is more of a dark navy, and the gold was more or a copper/rose gold effect - really smart and looks great on. Great watch was not disappointed with quality. So far so good, person loves the watch and has come with more features than I even knew! looks so much better in person with a lovely shine , the leather straps seen good aswell. And delivery was very impressive. The watch I received was lovely I was very pleased as it is a gift for my husband . I would recommend this sight. The look of the watch is very stylish, it looks a good quality watch and I think that for what I paid it is very reasonable. I hope my boyfriend will like it too! Striking watch, great price and service is second to none. 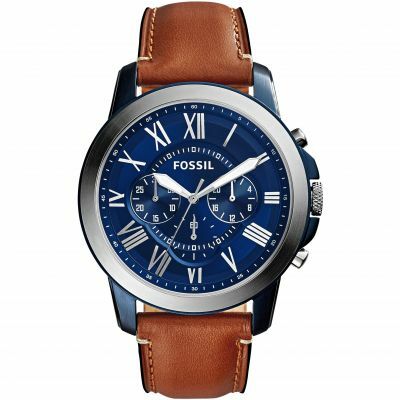 absolutely beautiful watch, trendy just classic just right for a professional young man. I originally ordered a black Fossil watch which went out of stock just as I ordered it. I was given a 10% off voucher for my troubles which was very generous. 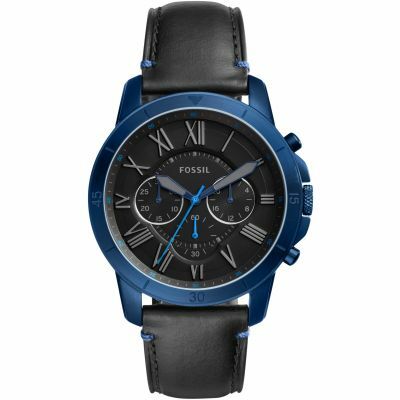 I then saw a different Fossil watch in blue which I got for a reduced price. Looks slightly darker than advertised but its classier. I was even happier with that one than the black one. So maybe it was fate. Anyway a great service from Watch Shop and a great price. 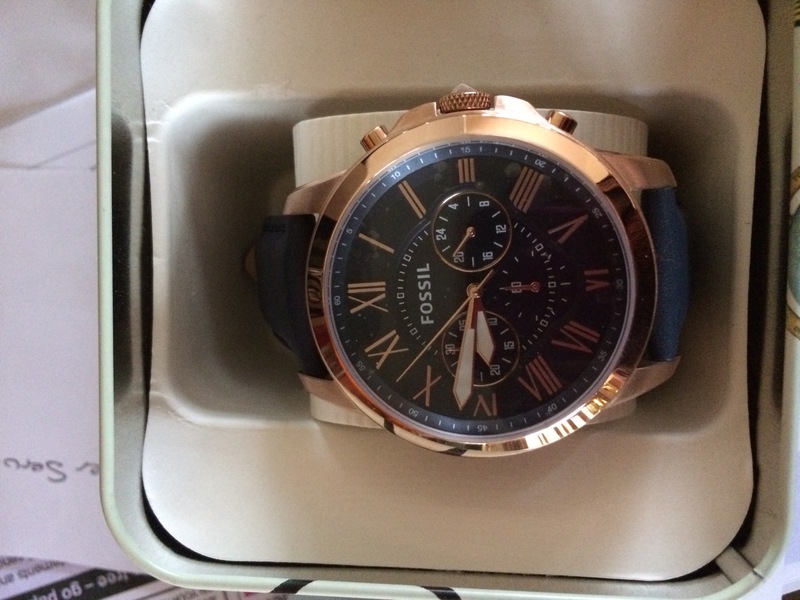 I bought a mens fossil watch as a gift for my boyfriend and he loves it. It was a great choice and is such lovely quality. Its smart/casual and goes well with any outfit or style. 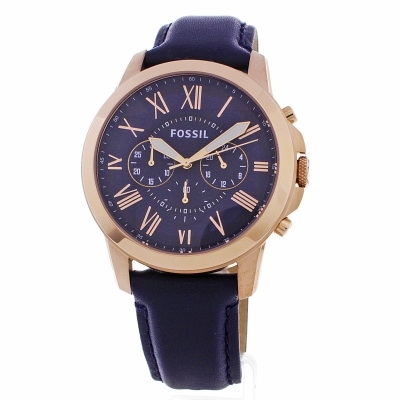 It has a navy blue strap and rose gold face which makes it really current and fashionable. It has a stop watch for seconds and minutes and also has a little dial for a 24 hour clock. Id really recommend this item! Fab watch. Was a Christmas present for my boyfriend. Opened to have a sneak preview and looks even better in person. All wrapped up and under the tree ready for the 25th now : Thanks Watch Shop. Excellent service and cheaper than previous seen . Classy watch . Hopefully Husband will think this is great. I think it looks very smart and the blue strap with rose coloured metal is spectacular but will have to wait until Christmas Day to find out what he thinks! Im very happy with my purchase. Good price and quick delivery. Fab watch, bought as a Christmas pressy for my hubby, I know hes going to love it, fab price and excellent service, arrived the day after ordering, very happy bunny. Having searched in shops for my husband to bes present I couldnt quite find the right watch at the right price. 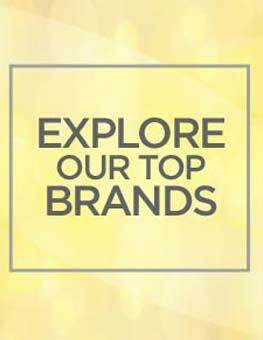 I saw an advert on a social media site for watch shop so I decided to take a look. I only looked for 5 mins before I had found a lovely blue watch with rose gold detail which was perfect to match his royal blue wedding suit..and only £76! There was free delivery and the tracking service was extremely efficient. My new husband absolutely loves his watch...I may get him to use the site for my Christmas present! Nice smart watch, very pleased. Amazing watch. The bronze cover contrasts well with the blue leather. I actually bought this watch for my husband and he loved it. It is soo amazing. Really pleased. Smart, clear love it. 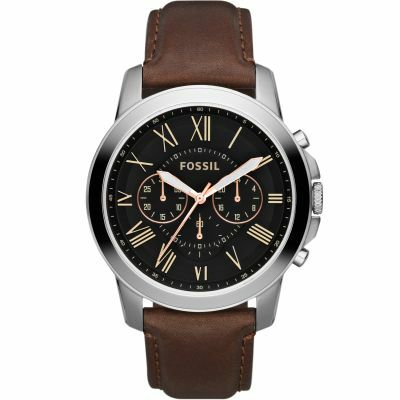 I brought this watch for my husband he already owns 5 other Fossil watches they are well made and reliable. I chose this style for colour, as a project manager image and time keeping are both important, this watch ticked both boxes. Placing an order via Watch Shop was very easy and straight forward. I am very happy with the product that I ordered. The description and the box came as described. There were no issues regarding the delivery date which was fantastic. I would recommend and use Watch Shop in the future again. Really happy with our purchase. The watch looks so much better in real life rather than pictures. Weve bought it for our sons 21st and I know hell love it. Very happy with the watch. It was my boyfriends birthday present. Came through the post next day. I HAVE HAD QUITE A FEW PEOPLE SAY I LIKE YOUR WATCH. This was bought as a gift for my son. He loved it. It is very very nice it looks classy. He especially liked it because the rose gold against the blue made it different. Overall a very good product at a very good price it was £36 cheaper than in the high street shop. Very nice watch. Looks better than the picture. Lovely colours, the blue of the strap works very well with the rose gold. I bought this watch as a birthday present for my boyfriend who fell in love with it instantly at first sight. I ordered it online and had it delivered to local available boutiques store of my choice which was convenient for me as having it delivered to house address would ruin the birthday surprise. The online service was quick and easy and I was amazed how quick it was delivered on Monday morning ordered on Friday night. It was beautifully gift wrapped and had the accurate personal message I wished to add, which already was aesthetically pleasing as well as saved me from a mess attempting to wrap. The watch was just how it looked online but more bold in colour, the blue strap appears durable and isnt too bright nor too dull. It has may holes in the strap which would be convenient to any wrist size. The dial of the watch appeared a lot bigger when placed on wrist and had the perfect shine. Although I must admit it appeared more rose gold than demonstrated online, which for me was very satisfying because its exactly the colour it was described as. My boyfriend and I are very pleased with the watch, the unique colour combination looks elegant with all outfits. Its both comfortable and sophisticated and isnt as expensive as it looks. A successful birthday present! Beautiful watch. I really liked the colour and unique quality the watch provides. A lot of great detail gives the watches a special quality. Very comfortable to wear. Amazing bold colour. Most importantly, it tells the time accurately. Brilliant colour ..vibrant blue straps that were not too bright and not too dark and very easy on the eye .Very modern design yet still quite traditional .